I saw this version of The Blob, as a youth, with the memory of Beware the Blob (1972) still in my head, so I went in with some pretty low expectations. It was the 1980’s and slime was in fashion, You Can’t Do that on Television, Garbage Pail Kids, Teenage Mutant Ninja Turtles, and countless other games, toys, and cartoons made kids go crazy for goop. A remake of The Blob seemed like a natural progression. The Blob is set in a drought stricken Colorado ski town called Arbeville. Arbeville is also home to power mullet aficionado and rebel without a cause, Brian Flagg (Kevin Dillon). While out riding his motorcycle and drinking beer, Brian discovers an old man, Can Man (Billy Peck) who decided that climbing into a meteor crater and poking things with a stick was a good idea. Can Man's arm is covered in strange pink ooze that is slowly dissolving him. Brian meets up with local cheerleader Meg (Shawnee Smith) and all around good American, Paul (Donovan Leitch). They all rush the old man to a doctor’s office, but the slime goes from slowly dissolving one hobo to quickly dissolving lots of people, and it isn’t long before the rapidly growing Blob makes its way into the sewers and heads for town. The acting is all around acceptable. Shawnee Smith’s Meg makes a very capable heroine, Kevin Dillon’s Brian is a bit of a lunkhead, but he rises to occasion. Special note should be made of the father of improvisational comedy, Del Close as the extra creepy, Revered Meeker. He puts in a fantastic performance that goes from awkward to full-on lunatic by the end of the film. He was also a writer for a 1980’s DC horror comic called Wasteland and wrote a brief story about being on the set of the Blob and full of pain killers for a scratch on his eye from his cat, check it out if you can track it down. I think it explains a lot about his performance. 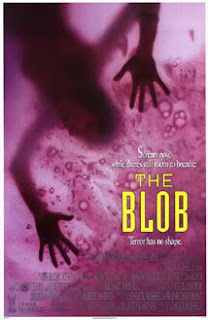 In a strange parallel to modern it day zombie movies, this more modern Blob is fast. There are a number of great set-pieces leading up to Blob attacks; a kitchen worker getting pulled into a sink, the Blob spilling over a phone booth, and it rushing through the sewer water towards its prey. The movie is very effective in making the Blob feel like a real threat. The Blob is a perfect example of what a remake should be like. It takes the core of its predecessor and explores it a new way without being a slavish copy of the original or so distant a concept that there was little reason to call it a remake aside from the marketing recognition of the name. It’s not afraid to be funny, or take some narrative chances, and it certainly aims for some spectacular gross-out moments. It’s a great b-movie that, while not as iconic as the original film, is just as worthy of viewing.